Arizona State University is one of the largest campuses in the nation, with more than 80,000 undergraduate and graduate students (2014). Almost a third of first-year students come to ASU from another state or country, and almost 20% of enrollment is at the graduate level. In 2011 the U.S. News & World Report gave ASU a No. 2 ranking in a list of "Up-and-Coming Schools" which were identified as national universities showing promise and innovation in academics, faculty and student life. In addition, the Academic Ranking of World Universities out of Shanghai Jiao Tong University ranked ASU 81st among the top 100 universities in the world. With university President Michael M. Crow at the helm since 2002, ASU has continued to shine. It considers itself a New American University, with an emphasis on research, student and faculty excellence, increased access to educational resources, and outreach to local and global communities. While the main ASU campus is in Tempe, Arizona, the university boasts other distinct campuses, including one in downtown Phoenix, one in the East Valley and one in the West Valley. Keep in mind that a good portion of ASU students take classes at more than one campus, so the enrollment figures for each campus do not add up to the true enrollment at any point in time. To see what makes each campus unique, take an online tour. In addition to the four Arizona State University campuses, ASU Online students join a community of online learners, take courses from the same professors that are on the campuses and gain access to ASU's libraries. Through this flexible program, it is possible to earn a bachelor's degree in liberal studies; various bachelor's degrees in applied science; a nursing degree; and master's degrees in various aspects of business, education and engineering; and degrees in other areas. In 2011, the online enrollment was about 3,000 students. 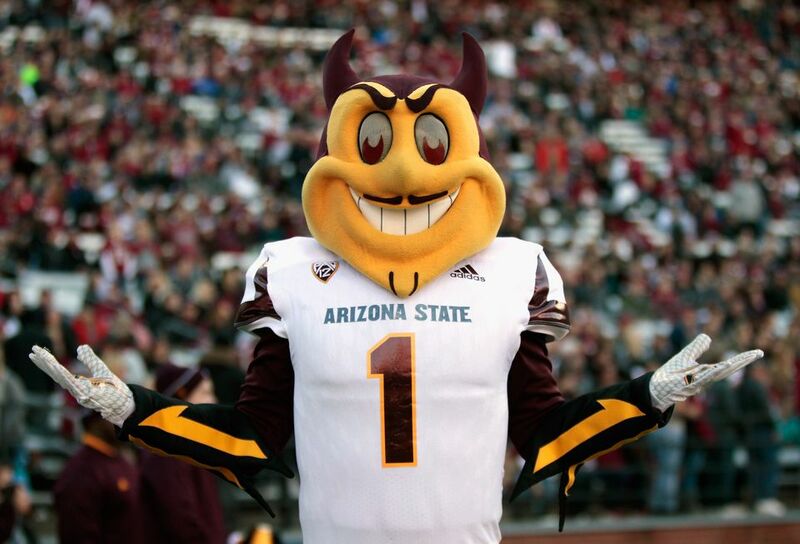 To learn more about Arizona State University, visit ASU online. The Tempe Campus at Arizona State University is the largest of all the campuses at ASU and is considered the main campus. Established: 1885, opening in 1886 as the Territorial Normal School. Location: Roughly bounded by Rio Salado Parkway, Mill Avenue, Apache Boulevard and Rural Road in downtown Tempe, Arizona. Find this campus on a map. Landmarks: Old Main, which dates back to 1898 and was the original classroom building; Palm Walk, where trees along the walkway date back several decades; the Biodesign Institute, a modern building of brick and glass; the Moeur Building, home of the Mars Space Flight Facility; the Memorial Union, a hub of restaurants, recreation and support services; ASU Gammage, one of Frank Lloyd Wright's last designs; Sun Devil Stadium; Hayden Library; ASU Art Museum; and Nelson Fine Arts Center. Campus housing: Among the most prominent residence halls are the Barrett Honors College Complex, Hassayampa, Sonora Center, Manzanita Hall and University Towers. ASU's Downtown Campus is within walking distance of many downtown Phoenix attractions, museums, entertainment venues, bars and restaurants. It was developed in the late 80s as "The Mercado" and was intended to be a mixed use commercial and retail development. ASU eventually took over the space. Established: 2006 through a City of Phoenix bond, with the first buildings opening in 2008. Location: Roughly bounded by Central Avenue, Polk Street, Third Avenue and Fillmore Street in downtown Phoenix. Find this campus on a map. Landmarks: Walter Cronkite School of Journalism and Mass Communication; Arizona Biomedical Collaborative; Nursing and Health Innovation buildings; University Center, with a bookstore and support services. Civic Space, home to a giant fishing net-like outdoor sculpture, serves as a student commons area. Arizona State University's West Campus is located in Glendale, Arizona. That's just west of Phoenix in the northwest part of the Greater Phoenix area. Established: 1984, in response to the Phoenix metropolitan area's growing population. Classes began in the late 1980s. Location: Thunderbird Road and 43rd Avenue in northwest Phoenix. Find this campus on a map. Landmarks: Fletcher Library; University Center, offering food, recreation and support services; the Classroom Lab/Computer Classroom building; Kiva Lecture Hall; Sands Classroom Building; and Plant Walk, featuring desert flora. Campus housing: Las Casas. A new residence hall and dining facility are set to open by Fall 2012. Location: 7001 E. Williams Field Road in Mesa, on the site of the former Williams Air Force Base. Find this campus on a map. Landmarks: the Academic Center; the Desert Arboretum; the Agribusiness Center, which includes a meeting place for students called Main Street; the Engineering Studio; and the Simulator Building for the campus' Professional Flight program. Campus housing: Five residential complexes, some for upperclassmen.